Those ruins do indeed look sweeeeet. And the Whirpool - way cool! We suggest a little while back that DF could do some rather cool effects overlays on their terrain trays such as whirpools, ominous ripples etc. We thought they could be made like a flexible fridge magnet. 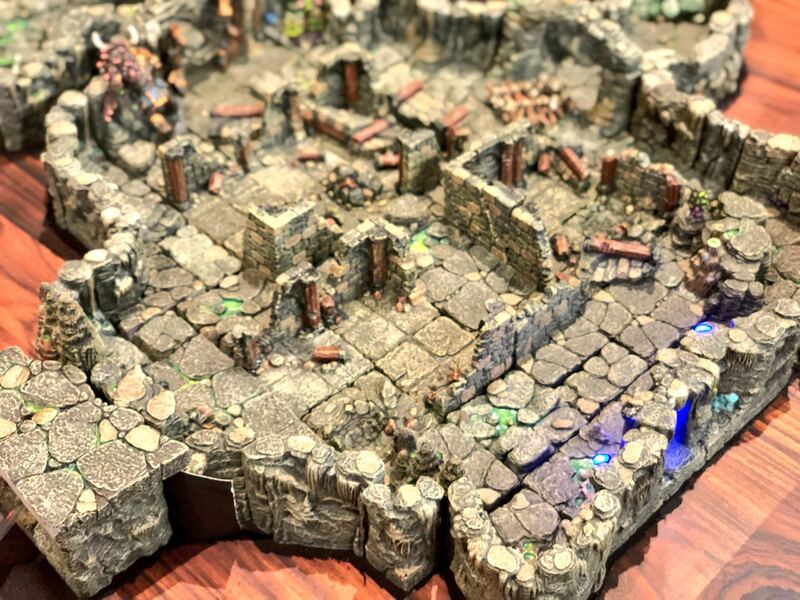 Hoping for more of these style terrain tray enhancements. We are now thinking of what cool effect could be achieved with vertical terrain trays. DF could provide a texture that gives you a vertical Cliff face or dungeon/castle wall add some feet to hold it upright - additiaonl carrots could be used to prop it up. You could use edge pieces to create a massive (or non massive) portal showing the void (or anything you want) then when activated you slap on your whirling vortex of doom and 100's of face eating gribblies teleport through. That whirlpool was actually something I painted on an old fruit container lid at around 10:30pm the Night before Nate was leaving. I'm not sure if it or something like it will make the final cut. I really really like your idea of little magnetized effects to stick on the terrain trays. I will suggest this to Nate. Two thumbs up for ruins! Ruination in the Deep Roads too for some underdark goodness? Terrain tray enhancements are a good idea. If they were small enough they could go on magnetic walls and corners also. Something like a void hole, or a protruding bit of something would look good. I am hoping for some kind of a chasm pack but magnetic and intended to stick to walls and such. Is it just me or is that a 4x2ish broken edge/chasm piece sitting on top of the fog machine exit? This is the best one I have, but there are pictures of the ruins that we released last year when we thought they were coming out with the Dungeon of Doom. I have made ruins for the past 2 sets, and the new set so I'm glad they are finally seeing the light of day. I like the giant bone/ivory arches and the cavern pit openings...and of course the rope bridge....woohoo!!! A whirlpool! Didn't notice that in the live stream.